Emory University recently opened the doors to its new Health Sciences Research Building, allowing researchers to move into their labs. The Emory University scientists in the new facility will focus their research on cancer, drug discovery, gastroenterology, neurosciences, immunology and vaccines, transplant immunology, biomedical engineering, nephrology, and human genetics. The 200,000-square-foot building’s construction began in June of 2011, and the $90 million it took to build the facility has already been paid for through philanthropy. According to an Emory University news article, the donors who gave money to the construction project include Robert W. Woodruff; O. Wayne Rollins; Joseph B. Whitehead; Zeist; Martha and Wilton Looney; Katherine John Murphy; Luther and Susie Harrison foundations; David, Helen and Marian Woodward Fund; Georgia Research Alliance; Raymond Schinazi; Margaret Hirst Davis; James and Helen Carlos; and two anonymous donors. In addition to having the funds available to build a $90 million research facility, Emory University has a great deal of research funding available for lab suppliers marketing life science solutions and university lab equipment at life science marketing events. In 2012, the NSF awarded Emory University $10.6 million in research funding. The funding was distributed among a number of different departments at the school. Of the money, $2.1 million went towards life science research projects. Among the numerous life science research programs awarded funding were systems and synthetic biology, genetic mechanisms, physiology and structural systems, neural systems, and cellular dynamics and function. Emory University was ranked 22nd by the NSF in 2009 for total R&D expenditures in the life sciences, having spent a total of $417 million. Emory University also received $286.2 million from the NIH in 2012. Life science departments at Emory University receiving NIH funding included microbiology, biomedical engineering, biostatistics, chemistry, family medicine, anatomy and cell biology, internal medicine, biochemistry, pharmacology, biology and veterinary science. In 2011, the NIH ranked Emory University 18th for direct plus indirect costs in the life sciences, excluding R&D contracts and ARRA awards, making the total costs $273.4 million. For a full list of departments receiving NIH funding organized by department, number of awards and total research funding, please visit the NIH website. 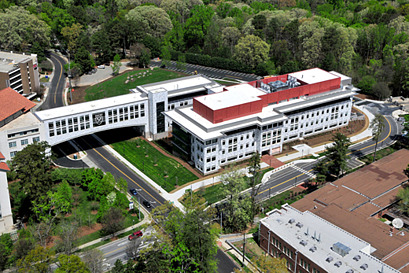 Emory University is an excellent university at which to market life science solutions and university lab equipment. If you are a lab supplier interested in meeting lab managers, purchasing agents and science researchers at Emory University life science marketing events, Biotechnology Calendar, Inc. invites you to attend our annual Atlanta BioResearch Product Faire™ Event. Last year’s Atlanta BioResearch Product Faire™ Event attracted 213 visitors, of which 58 were purchasing agents, professors and post docs, and 30 were lab managers. The attendees came from 34 different research buildings and 55 departments across campus. Biotechnology Calendar, Inc. is a full-service science research marketing and events-planning company that organizes life science marketing events at top research universities nationwide. For more information on the Atlanta BioResearch Product Faire™ Event or to find Emory University funding statistics, click on the button below. If you are interested in marketing your university lab equipment and life science solutions at life science marketing events closer to home, we encourage you to view our 2013 calendar of events.